WEST LAFAYETTE, Ind. 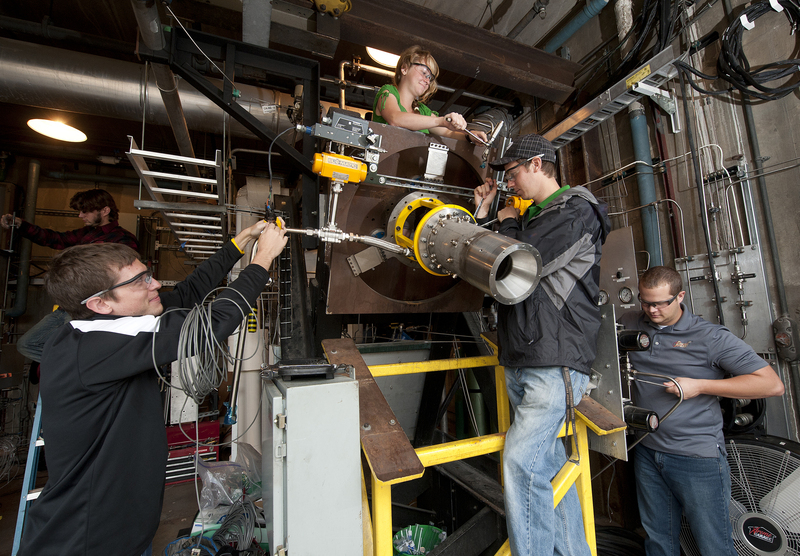 – Purdue University students are designing and building a rocket engine that might be used in a vehicle to land on the moon. Graduate students Thomas Feldman and Andrew Rettenmaier are part of a team developing a thrust chamber for NASA's Project Morpheus, which includes research to develop new technologies for future trips to the moon, Mars or asteroids. The rocket must meet stringent design and performance specifications related to factors including efficiency, size and weight limits, thrust and the ability to dynamically throttle the rocket from 1,300-4,200 pounds of thrust, Feldman said. "This thrusting range is needed because during the initial descent, when the lander is fully fueled, it will weigh significantly more than at the end of the mission when most of the propellant will be gone," he said. "When it lands, the rocket will have a thrust-to-weight ratio of about one." The rocket, which will use liquid oxygen and liquid methane propellants, is being designed, built and tested using specialized facilities at Purdue's Maurice J. Zucrow Laboratories, including a new facility to liquefy the methane propellant. The research, which began as a senior design project last fall, is entirely voluntary. "It's a very interesting and demanding problem," said William Anderson, an associate professor of aeronautics and astronautics and adviser to the students. "They are applying their education for a truly important venture." Feldman and Rettenmaier, who both have career aspirations to work in the aerospace industry, said the project is providing valuable experience and preparation for the job market. "This is something you would never learn by reading a book or taking conventional classes," said Feldman, who is from Austin, Texas. "Most universities aren't going to provide the experience to do this." Feldman recently was awarded a 2011 Liquid Propulsion Student Award from the American Institute of Aeronautics and Astronautics Liquid Propulsion Technical Committee. Rettenmaier, who is from Fort Wayne, Ind., said Purdue's propulsion facilities influenced his decision to remain at the university for his graduate studies. "It's such an interesting and unique place to work," he said. "If we design an engine that ends up landing on the moon, I think that would be a great accomplishment." A development test chamber has been designed and is ready for testing. This heavily instrumented chamber is far bulkier than the eventual flight chamber, and data from upcoming tests will be used to refine the flight engine's design. Other students working on the project include graduate students Michael Bedard, Isaac Statnekov and Emma McKinney and undergraduates David Hailey and Ryan Tatro.